You've made one color wheel pin cushion, now you can make more! All the hard to find bits and pieces are right here ready for you. 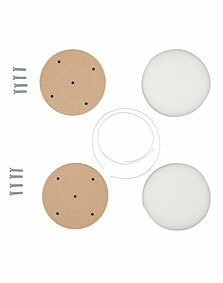 Pack includes 2 foam rounds, 2 tufting cords, 8 machine screws, and 2 plywood bases.